For the period in British history, see The Protectorate. A protectorate, in its inception adopted by modern international law, is a dependent territory that has been granted local autonomy and some independence while still retaining the suzerainty of a greater sovereign state. In exchange for this, the protectorate usually accepts specified obligations, which may vary greatly, depending on the real nature of their relationship. Therefore, a protectorate remains an autonomous part of a sovereign state. They are different from colonies as they have local rulers and people ruling over the territory and experience rare cases of immigration of settlers from the country it has suzerainty of. However, a state which remains under the protection of another state but still retains independence is known as a protected state and is different from protectorates. In amical protection, the terms are often very favorable for the protectorate. The political interest of the protector is frequently moral (a matter of accepted moral obligation, prestige, ideology, internal popularity, dynastic, historical or ethno-cultural ties, etc.) or countering a rival or enemy power (e.g., preventing the rival from obtaining or maintaining control of areas of strategic importance). This may involve a very weak protectorate surrendering control of its external relations; this, however, may not constitute any real sacrifice, as the protectorate may not have been able to have similar use of them without the protector's strength. Amical protection was frequently extended by the great powers to other Christian (generally European) states and to smaller states that had no significant importance[ambiguous]. In the post-1815 period, non-Christian states (such as China's Qing dynasty) also provided amical protection towards other much weaker states. In modern times, a form of amical protection can be seen as an important or defining feature of microstates. According to the definition proposed by Dumienski (2014): "microstates are modern protected states, i.e. sovereign states that have been able to unilaterally depute certain attributes of sovereignty to larger powers in exchange for benign protection of their political and economic viability against their geographic or demographic constraints" Examples of microstates understood as modern protected states include such states as Liechtenstein, San Marino, Monaco, Niue, the Cook Islands or Palau. Conditions regarding protection are generally much less generous for areas of colonial protection. The protectorate was often reduced to a de facto condition similar to a colony, but using the pre-existing native state as an agent of indirect rule. Occasionally, a protectorate was established by or exercised by the other form of indirect rule: a chartered company, which becomes a de facto state in its European home state (but geographically overseas), allowed to be an independent country which has its own foreign policy and generally its own armed forces. In fact, protectorates were declared despite not being duly entered into by the traditional states supposedly being protected, or only by a party of dubious authority in those states. Colonial protectors frequently decided to reshuffle several protectorates into a new, artificial unit without consulting the protectorates, a logic disrespectful of the theoretical duty of a protector to help maintain its protectorates' status and integrity. The Berlin agreement of February 26, 1885 allowed the colonial powers to establish protectorates in Black Africa (the last region to be divided among them) by diplomatic notification, even without actual possession on the ground. A similar case is the formal use of such terms as colony and protectorate for an amalgamation, convenient only for the colonizer or protector, of adjacent territories over which it held (de facto) sway by protective or "raw" colonial logic. Protectorates differ from League of Nations Mandates and their successors, United Nations Trust Territories, whose administration is supervised, in varying degrees, by the international community. A protectorate formally enters into the protection through a bilateral agreement with the protector, while international mandates are stewarded by the world community-representing body, with or without a de facto administering power. A protectorate is a territory which is not formally annexed but in which, by treaty, grant or other lawful means, the Crown has ultimate power and jurisdiction. A protectorate differs from a "protected state". A protected state is a territory under a ruler which enjoys Her Britannic Majesty's protection, over whose foreign affairs she exercises control, but in respect of whose internal affairs she does not exercise jurisdiction. The condition of a protected dependency is more acceptable to the half-civilised races, and more suitable for them than direct dominion. It is cheaper, simpler, less wounding to their self-esteem, gives them more career as public officials, and spares of unnecessary contact with white men. 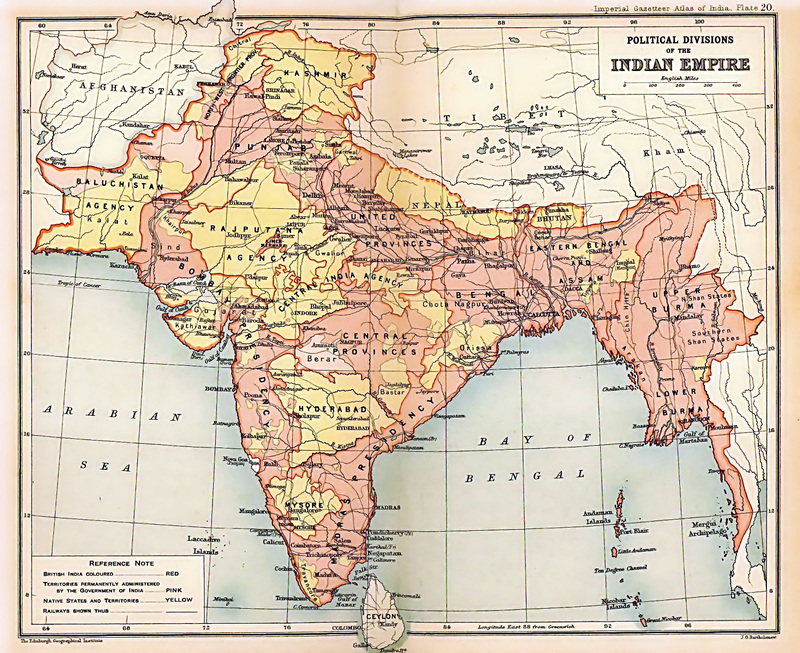 The Princely States of India were ruled indirectly. So too was much of the West African holdings. When King George III issued The Royal Proclamation of 1763 he established the framework for the negotiation of treaties with the Aboriginal inhabitants of large sections of North America and legally defined an area of the North American interior as a vast Indian reserve. King George reserved the western lands to the "several nations or tribes of Indians" that were under his "protection" as their exclusive "hunting grounds." As sovereign of this territory, however, the king claimed ultimate "Dominion" over the entire region. These nations or tribes would be considered protectorates by treaty. The treaty-making procedures that evolved in the crown colony of Upper Canada were later exported to the territories purchased in 1870 by the new Dominion from the Hudson's Bay Company. A basis of land tenure was established throughout most of the prairie provinces and Northern Ontario, where seven numbered treaties were negotiated in the 1870s, on the principles outlined in the Royal Proclamation of 1763. In other large areas of the country where the treaty-making provisions of the Royal Proclamation have never been implemented, Aboriginal land rights are legally enforceable. When the British took over Cephalonia in 1809, they proclaimed, "We present ourselves to you, Inhabitants of Cephalonia, not as invaders, with views of conquest, but as allies who hold forth to you the advantages of British protection." When the British continued to occupy the Ionian Islands after the Napoleonic wars, they did not formally annex the islands, but described them as a protectorate. The islands were constituted by the Treaty of Paris in 1815 as the independent United States of the Ionian Islands under British protection. Similarly, Malta was a British protectorate between the capitulation of the French in 1800 and the Treaty of Paris of 1814. Other British protectorates followed. In the Pacific Ocean the sixteen islands of the Gilberts (now Kiribati) were declared a British Protectorate by Captain Davis R.N., of HMS Royalist between 27 May and 17 June 1892. The Royalist also visited each of the Ellice Islands and Captain Davis was requested by islanders to raise the British flag, but he did not have instructions to declare the Ellice Islands as a protectorate. The nine islands of the Ellice Group (now Tuvalu) were declared a British Protectorate by Captain Gibson R.N., of HMS Curacoa, between 9 and 16 October of the same year. Britain defined its area of interest in the Solomon Islands in June 1893, when Captain Gibson R.N., of HMS Curacoa, declared the southern Solomon Islands as a British Protectorate with the proclamation of the British Solomon Islands Protectorate. In 1894, Prime Minister William Ewart Gladstone's government officially announced that Uganda was to become a British Protectorate, where Muslim and Christian strife had attracted international attention. The British administration installed carefully selected local kings under a program of indirect rule through the local oligarchy, creating a network of British-controlled civil service. Most British protectorates were overseen by a Commissioner or a High Commissioner, rather than a Governor. British law makes a distinction between a protectorate and a protected state. Constitutionally the two are of similar status where Britain provides controlled defence and external relations. However, a protectorate has an internal government established, while a protected state establishes a form of local internal self-government based on the already existing one. Persons connected with former British protectorates, protected states, mandated or trust territories may remain British Protected Persons if they did not acquire the nationality of the country at independence. The last British protectorate proper was Solomon Islands, which gained independence in 1978; the last British protected state was Brunei, which gained full independence in 1984. Asterisks denote protectorates which were governed from a colony of the same name. Comoros 21 April 1886 French protectorate (Anjouan) till 25 July 1912 when annexed. Morocco - most of the sultanate was under French protectorate (30 March 1912 - 2 March 1956) although, in theory, it remained a sovereign state under the Treaty of Fez; this fact was confirmed by the International Court of Justice in 1952. The northern part of Morocco was under Spanish protectorate in the same period. Tunisia, 12 May 1881 becomes a French protectorate by treaty to 20 March 1956 when terminated. Besides these colonial uses, within Europe Nazi Germany established the Protectorate of Bohemia and Moravia (1939–1945) in the ethnically Czech regions of Czechoslovakia. Independent State of Croatia, 1941-1943. Cabinda (Portuguese Congo) (1885–1974) - Portugal first claimed sovereignty over Cabinda in the February 1885 Treaty of Simulambuco, which gave Cabinda the status of a protectorate of the Portuguese Crown under the request of "the princes and governors of Cabinda". Spanish Morocco protectorate from 27 November 1912 until 2 April 1958 (Northern zone until 7 April 1956, Southern zone (Cape Juby) until 2 April 1958). the Marshall Islands, the Federated States of Micronesia, and Palau currently have a similar status (associated state) after their independence. Some agencies of the United States government, such as the United States Environmental Protection Agency, still use the term protectorate to refer to insular areas of the United States such as Guam, the Commonwealth of the Northern Mariana Islands, Commonwealth of Puerto Rico and the U.S. Virgin Islands. This was also the case with the Philippines and (it can be argued via the Platt Amendment) Cuba at the end of Spanish colonial rule. Liberia was the only African nation on the African continent that was a colony for the United States and a protectorate from January 7,1822 until the Liberian Declaration of Independence in July 26,1847. Liberia was founded and established as a homeland for freed African-Americans and ex-Caribbean slaves settlers who left the United States and the Caribbean islands with the help and support from the American Colonization Society. However, the agency responsible for the administration of those areas, the Office of Insular Affairs (OIA) within the United States Department of Interior, uses only the term "insular area" rather than protectorate. West Papua, (then known as West New Guinea or West Irian), United Nations Temporary Executive Authority, 1962-1963. Cambodia, United Nations Transitional Authority in Cambodia, 1992-1993. Eastern Croatia, United Nations Transitional Authority for Eastern Slavonia, Baranja and Western Sirmium, 1996-1998. East Timor, United Nations Transitional Administration in East Timor, 1999-2002. Bosnia and Herzegovina were a joint Austrian and Hungarian protectorate since 1878 which formally still belonged to the Ottoman Empire until 1908 when it was annexed by Austria-Hungary (see Bosnian crisis). Since the 1995 Dayton Agreement, Bosnia and Herzegovina is again sometimes described as a de facto international protectorate. ↑ Lakshmi Iyer, "Direct versus indirect colonial rule in India: Long-term consequences." The Review of Economics and Statistics (2010) 92#4 pp: 693-713 online. Robert Aldrich. Greater France: A History of French Overseas Expansion. Palgrave MacMillan (1996) ISBN 0-312-16000-3. Alice L. Conklin. A Mission to Civilize: The Republican Idea of Empire in France and West Africa 1895-1930. Stanford: Stanford University Press (1998), ISBN 978-0-8047-2999-4. Patrick Manning. Francophone Sub-Saharan Africa, 1880-1995. Cambridge University Press (1998) ISBN 0-521-64255-8. This page was last modified on 21 December 2015, at 06:39.